At some point during the transition over to object oriented programming, you’re going to hit upon a ‘class not found’ error. In this video we walk you through how to track down the source of the problem and get it fixed. Pow! Okay. So, we're getting an error here. It says fatal error class Drupal blind d8 route object interface not found, and then it tells us to look on line 29 of blind d8 subscriber. So, let's go back to our code and take a look at that line. Line 29 is right here, and you can see that this class here is highlighted right now. Now, the reason that this is highlighted is because as far as this code can tell - as far as PhpStorm can tell - this class doesn't actually exist, and if we look at the error message - I'm going to jump back to the browser here - it says class Drupal blind d8 route object interface. Now, in our module we haven't defined any route object interface. We might not even be sure what that is. So, why is it looking for it in this name space? Well, the reason is because we haven't set up an alias for wherever this class is supposed to be found. So, if we do a search - I'm going to go back to our code - and let's do a search for route object interface route name across our code base. So, I'm going to pull up the search, click find, and we see multiple examples here. Some of these pulled from a request variable that gets defined earlier on in the code or gets passed in like here. So, let's find one that looks more like what we have. All right. So, we're going to skip this one because it's in blind d8 subscriber. We'll continue to go down. All right. 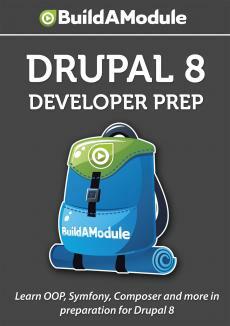 Here we go in block module - Drupal request. So, this is a similar structure to what we're using in our code, and if we look over here in the file, again this right hand side is a preview of the file that this is found in - so, block. module. We see Drupal request attributes get route object interface route name, and if we scroll up to the very top of this file - I'm just going to keep scrolling, scrolling, scrolling - we see that we're using Symfony CMF component routing route object interface, and this is the line that we're missing.